Your teeth are remarkably strong. In fact, they are made from the strongest substance in your entire body. Unfortunately, this doesn’t mean they are invincible. Even healthy teeth are subject to fracture or injury under certain pressures. At Crabapple Dental, we proudly offer chipped tooth repair as part of our comprehensive menu of general dentistry services. Whether you suffered a bad fall or bit down on something too hard, we understand the disruption and discomfort that a chipped tooth can bring. Therefore, we deliver prompt attention and top-quality care when it comes to damaged tooth repairs. A chipped tooth doesn’t have to be visible or produce pain in order to require treatment. When the outer structures of a tooth are damaged, the health of the tooth is compromised. It becomes more vulnerable to decay, infection and other serious dental issues. Therefore, it is important to seek treatment early so that your tooth can be restored back to its original strength, function and appearance in a timely manner. 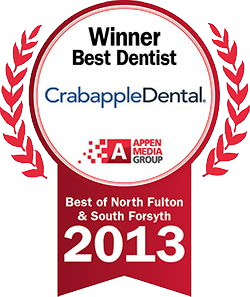 At Crabapple Dental, we are equipped to offer a variety of solutions for cracked, chipped or broken teeth. In fact, we can maximize your comfort and results by using our cutting-edge dental technology and modern equipment to restore your tooth. Our office implements needle-free dentistry and sedation dentistry when necessary, and we have a state-of-the-art CEREC machine that creates custom crowns in a single visit. Whether you need simple dental bonding to repair a front tooth chip or a full dental crown to restore a broken molar, we are confident we can give you the superior results you need and the pleasant experience you deserve. 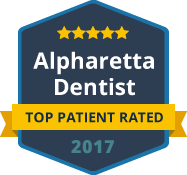 If you live in the greater Alpharetta area and need chipped tooth repair from a reputable dentist, contact Crabapple Dental today. We repair fractured teeth using the most durable, natural-looking materials in modern dentistry.